If you suffer from varicose veins, there’s a chance that somebody will have mentioned vein stripping to you as a solution… You won’t have heard it from us! When this outdated surgical procedure is performed, general (or sometimes spinal) anaesthesia is used. A surgeon cuts in to your groin to tie off the saphenous vein (a large superficial vein on the leg) at its origin. More incisions are then made along the leg to allow the insertion of a special stripping tool into the vein. The varicose vein is then, quite literally, ‘stripped’ from the leg. Sounds painful, doesn’t it? And that’s because it is! 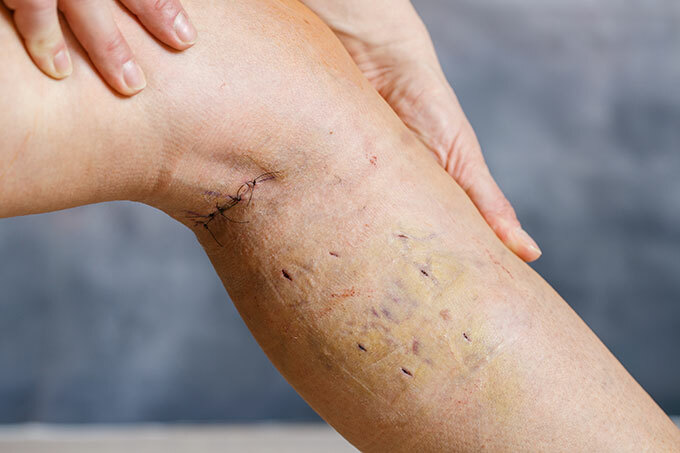 Varicose vein stripping is best avoided, because apart from this unnecessary pain it also involves a long recovery period, together with other associated risks. And after a painful surgery and long recovery period, there’s also a chance that the varicose veins could return as the success rate is well below that of EVLA (70% vs 98%)! At enhanceskin, we’re proud to use modern technology that allows us to offer our clients minimally invasive, walk-in and walk-out treatments. Endovenous Laser Ablation (EVLA), the gold standard varicose vein treatment, again, requires no general anaesthesia or hospital stay. You walk in and walk out (wearing compression stockings for two weeks), and you are even able to drive home afterwards. The newest treatment we offer is Venaseal, a medical glue that closes off Varicose Veins. There is no need for stockings in those who it suits as a treatment! You can also travel by air at any point after treatment. Before we embark on any treatment plan, we offer a FREE full doctor’s vein assessment, and a scan will help to determine the treatment most suitable for you. Contact us to book your appointment with David!